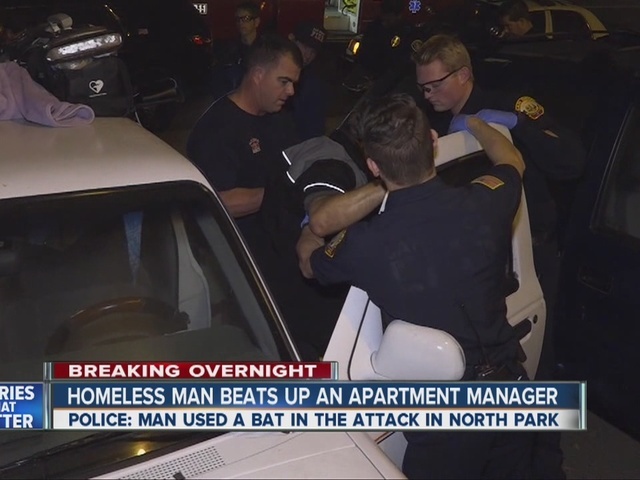 SAN DIEGO – A homeless man beat an apartment manager with a bat early Thursday morning in North Park, according to San Diego police. The victim told officers he was checking on a property in the 4000 block of Oregon Street sometime before 3 a.m. when he found a homeless man in front of the building. The manager tried to get the suspect to leave. At that point, the homeless man reportedly went to the manager’s truck, pulled out a baseball bat and started to beat the manager with it. He struck him a couple time and then ran off, police said. When officers and paramedics arrived at the scene, the manager was sitting in his truck with an injured leg. He was transported to a hospital. Officers searched the area for the attacker, but could not locate him. They did recover the baseball bat, however. There was no immediate suspect description. The investigation is ongoing.